Your deer hunting areas, or a whitetail hunters trophy deer hunting area must provide deer with year-round quality food, cover for security, and water. Trophy whitetail deer live and stay in prime hunting areas in which the food and water they need is easily accessible without to much excessive movement throughout that area. A hunting areas cover that trophy deer hunts use is almost always to their advantage. The areas they often bed in are thickly wooded edges with the wind to their backs, and an open line of sight to their front, with a quick escape route into a thick area of cover nearby. It isn’t until the pre-rut period (when whitetail buck’s establish area dominance) and then the rut’s start (breeding season) that trophy whitetail deer start to become less reclusive and move about more in the hunting area. It is during the rut that their movement patterns increase throughout hunting areas at various times throughout a 24 hour period; staying unpredictable. As trophy deer hunters; this is the type of hunting land we want access to. States have set aside public lands for hunting. Check with your states D.N.R. or Fish & Game for public hunting areas. Some of these are prime hunting areas that any licensed hunter can hunt. It is based on a first come, first use. Since the states taxpayers own these areas, and it has been set aside specifically for public hunting, no one can lay claim to it as their own personal hunting area for deer. 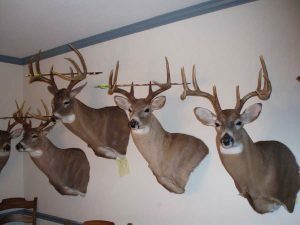 In some states the building of a permanent stand in public deer hunting areas is not allowed. Or if it is, anyone can use a that stand if no one is using it when any legal hunters finds it. As hunters hunt public lands, we must except this principle of public use. We need to understand that other hunters have a right to be on the land we are deer hunting on. Even in a trophy deer hunting area that we have hunted on a regular basis in past years. If this is unappealing to us, we have only one other choice; we need to hunt a private hunting area. We have options here. We can purchase our own trophy deer hunting real estate. We can lease private hunting land, or ask permission from a landowner. Hunting real estate values have risen sharply in the past decade. Wooded, prime deer hunting areas are in demand. A good local real estate agent, who is also a deer hunter, would be a good person to contact to find one of these areas for deer. Let them be your advocate and do the leg work in finding that land you desire. If hunting land values seem to expensive for you, then you may want to consider a hunting camp partnership in which two or more hunters go together to purchase a piece of land, or deer hunting real estate. If everyone can get along and are willing to work together, this can be very beneficial as all expenses incurred for this hunting land will be shared. The key is to be able to get along and agree on everything concerning your whitetail hunting land and it’s use. The option of leasing a deer hunting area is gaining popularity. In some cases leasing an area of hunting land is very inexpensive compared to owing it. At times, the lease is less than what the real estate taxes would be if you owned it as recreational property. Companies that own wooded land for logging activities sometime lease out hunting lands. They usually have some restrictions of use, but these can be great hunting areas that hold trophy deer. Once you have a lease, then it’s yours to hunt on and trespassing is not allowed. Many farmers who own wooded land, and do not hunt whitetail deer themselves, maybe willing to lease hunting areas as long as liability issues are addressed. The other private property option is to ask permission of a private landowner. This may be the easiest, and least expensive option. Once a good relationship is established between you and the landowner, you may find you have great trophy deer hunting area to use, year after year, for your hunting trips. If you have a son or daughter you introducing to deer hunting bring them with when you go to ask permission to hunt on private land. Many times a landowner will easily grant permission when you are accompanied by a young prospective hunter. We have many options when it comes to great hunting areas for trophy whitetail deer. Find out which one, or combination, works best for you. As always, demonstrate and practice good land stewardship principles and techniques. Good luck hunting.